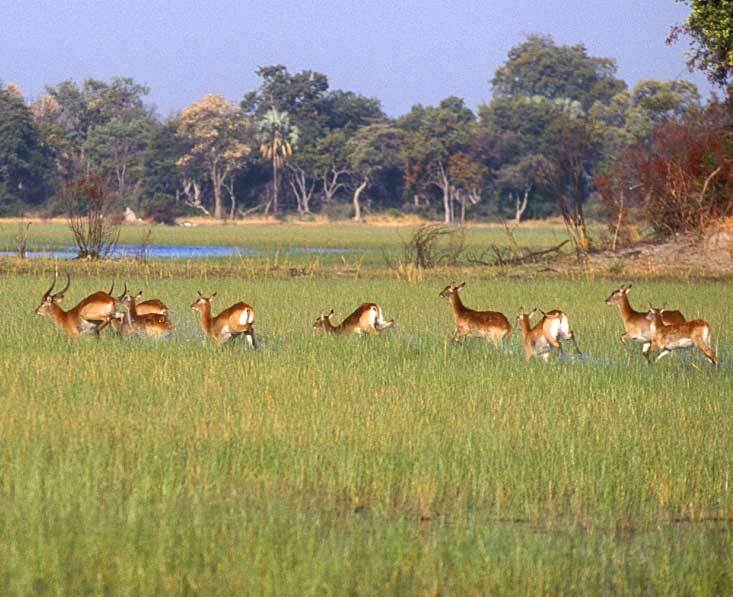 Explore two different areas of the Okavango Delta for exciting game drives, mokoro trips and perhaps a bush walk. Enjoy game drives and a boat safari in Chobe known for attracting huge herds of elephants in the dry season. 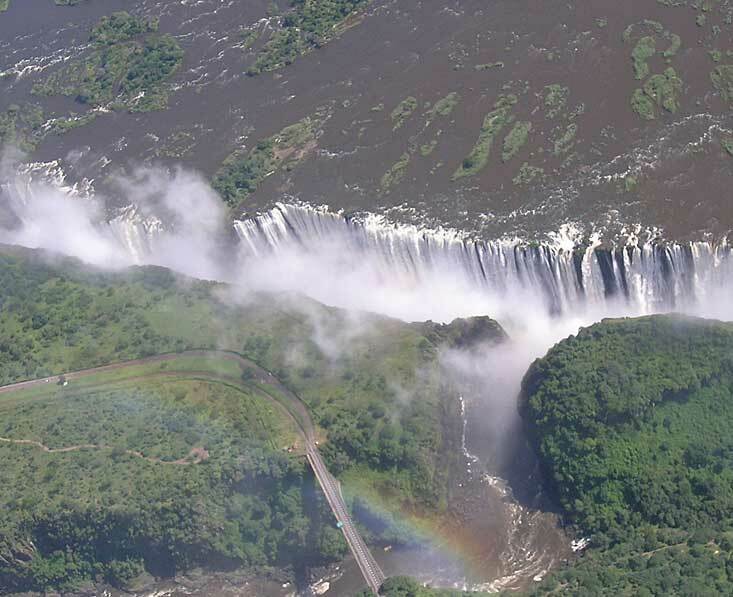 But before all this, take time to see the impressive Victoria Falls. On arrival at the Victoria Falls airport in Zimbabwe you will be met by a local representative and transferred to your guest lodge. Arrive in time to settle into your room before enjoying the afternoon at leisure. Day 2 Today you have a full day to explore the Victoria Falls area. 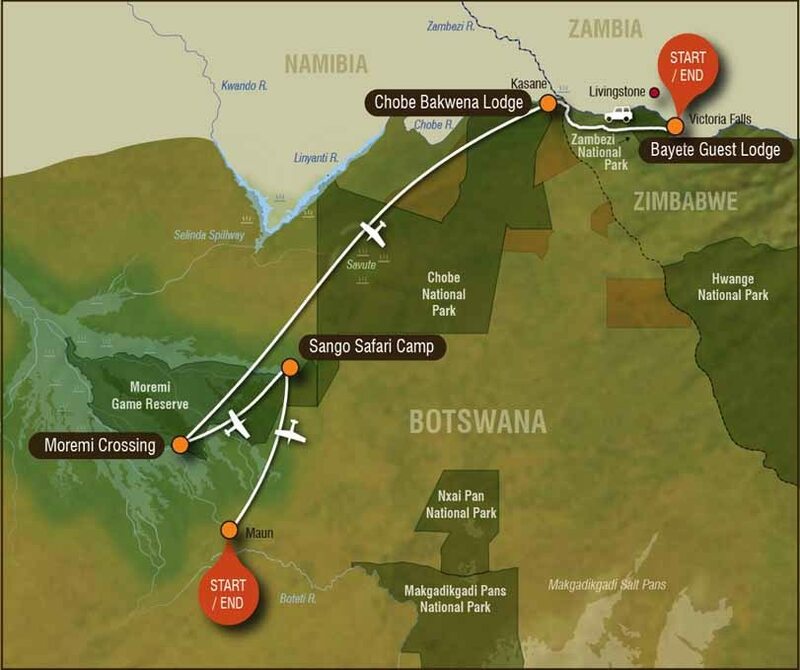 After an early breakfast you will be transferred to the border post and complete the formalities before crossing into Botswana and heading to your lodge on the Chobe River east of the park. Arrive at the lodge in time for lunch before and afternoon of game viewing. Day 4 Today you’ll have a full day enjoying game viewing activities. 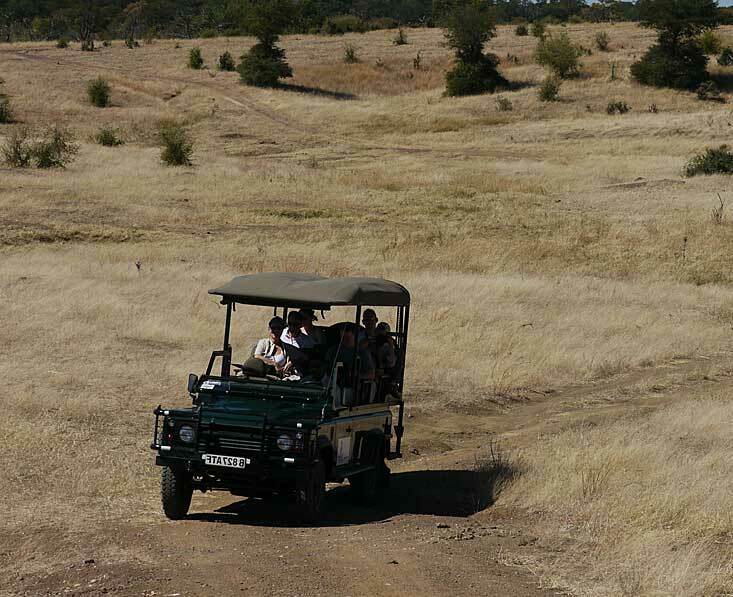 You can choose from game drives, cruising on the river and birding. 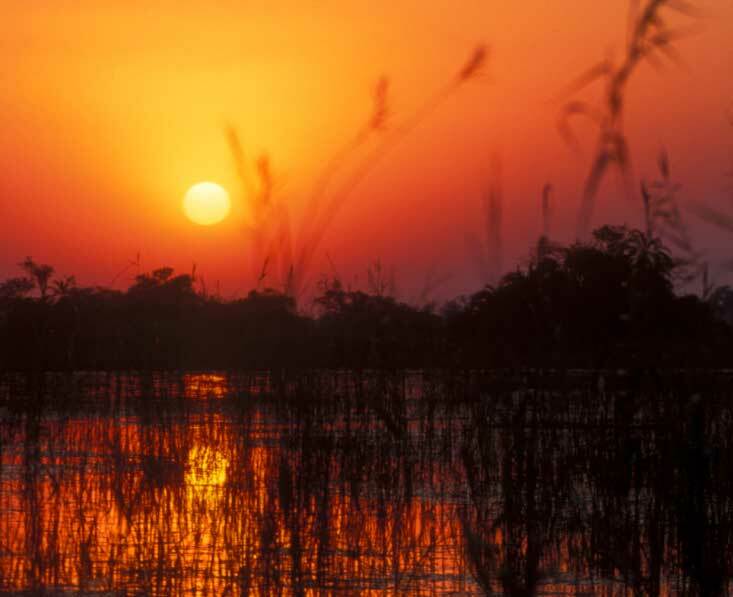 After breakfast and a morning activity (time permitting) you will be transferred to Kasane airport and board a light aircraft transfer to Okavango Delta and to your safari camp. You will arrive at the camp in time for lunch before heading out on an afternoon activity. Enjoy a full day of game viewing activities. This is a water-based and walking camp, so your choice includes game viewing on mokoro excursions, guided walks, fishing, motor boating and sunset cruises. After your morning game activity and breakfast you will drive to the airstrip and take a light aircraft transfer further north in the Okavango Delta to your next camp. Arrive in time for an afternoon of game viewing. Day 8 Today you have a final full day of game viewing activities; game drives in open 4×4 safari vehicles which offer some of the finest dry land game viewing in Botswana with regular sightings of lion and leopard, exploring the water ways in mokoro (traditional dugout canoes), guided nature walks, night drives and sunset cruises. After breakfast and a morning activity (time permitting) you will be transferred by light aircraft to Maun where you will connect to your onward flight arrangements, taking home wonderful photos and memories. This trip starts in Victoria Falls and ends in Maun. From the UK, we recommend getting a flight with a combination of British Airways, Air Botswana and/or South African Airways via Johannnesburg. This trip can be done in reverse. A rough price guide per person would be £900 – £1400 in economy depending on the season. 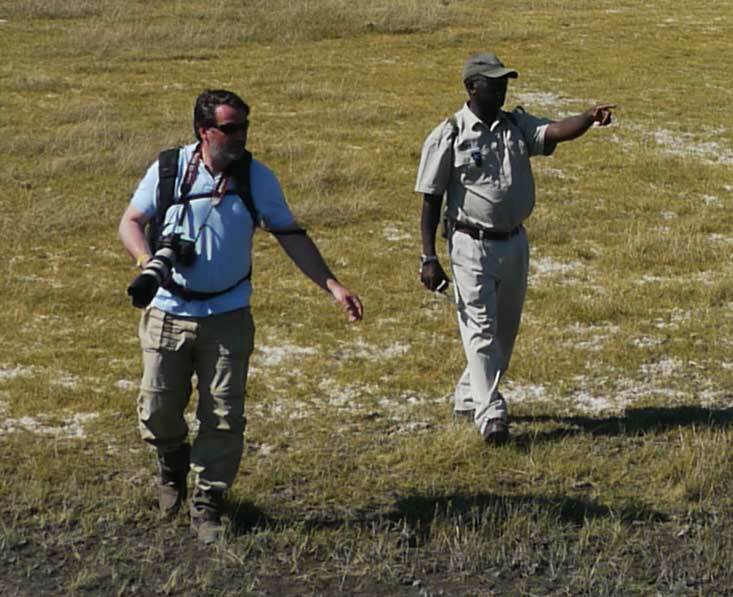 This is a private tailor made fly-in safari which we can arrange for you at any time you like subject to availability. We can change this trip in any way, from duration to places and lodges. This will of course affect the price. Per person prices based on two people sharing. Please ask for single supplements. Plus international flights from roughly £1200 pp. Accommodation, meals (breakfast at Victoria Falls & full board for safari), local drinks at Moremi Crossing and Safari Safari Camp, road and light aircraft transfers, daily activities on safari, park and concession fees. Visas, international flights, meals not listed, drinks at Victoria Falls and Chobe and premium drinks on safari, optional activities, travel insurance, personal expenses. January NPeak of the wet season, though it still doesn’t rain every day. Warm days (average 30°c but can be as hot as 40°c) and nights (20°c). Lush green foliage and flowers and birds in song. Peak breeding time for many migrant birds. Great month for photography, with gorgeous colours and dramatic skies. Predators have an easy time preying on the young plains game. The Kalahari and Salt Pans are now flush with fresh grass attracting lots of wildlife. In the Pans, thousands of zebras and wildebeest have come to graze here from the west. Lions and other predators benefit from this surfeit of game. February NPeak of the wet season, though it still doesn’t rain every day. Still very hot. It can reach up to 40° during the day but the average is still about 30°c. Waterlilies are at their best, as are many of the smaller creatures such as birds, frogs and butterflies. The Kalahari and the Pans are still at their best for wildlife. It’s still a great month for photography. March NNStill hot days and warm nights, but cooling a little, and the rain is dwindling. The Kalahari and the Pans are still generally good for wildlife. Birding is still very good. Nearby Victoria Falls is in full flood. Marula trees are in fruit and elephants go a long way to find these tasty treats. April NNThe rain has stopped. Nights begin to cool off, though days can still be very hot. The impala rutting season is well under way, with males in peak health displaying to females and trying to ward off rivals. In the Salt Pans the herds can begin to move from between about now and May over to the permanent water source of the Boteti River. The aptly named sausage trees are now bearing their pendulous fruit. In Nxai Pan the waterhole is the focus as general groundwater has mostly dried up now. Large numbers of mammals, and especially elephants hog the waterhole for as long as they can. May NNNTemperatures begin to drop more noticeably, with nights averaging about 15°c and daytime temperatures still around 30° but rarely getting above 35°c. Floodwaters begin to reach the top of the Okavango Delta. Migratory birds begin to depart for winter. The land begins to dry out and animals start moving towards permanent water sources. June NNNIt’s getting colder. You’ll need warm clothes for the cold nights, evenings (down to around 5°c, less in the desert) and mornings, but these give way to sunny warm days in the mid-20s. Wild dogs begin to den. For the next 3-4 months the dogs are generally easier to find as they are never too far from the den. All but the largest seasonal waterholes have dried up by now, so the main rivers and lagoons are the focus for wildlife. It’s getting dusty, grasses are dying back and trees are shedding leaves. It’s all turning brown. July NNNThis is winter and it can be very cold in mornings and evenings. By now, most areas of the Delta have felt the arrival of the floods. It’s a godsend for an increasingly parched landscape and its inhabitants. 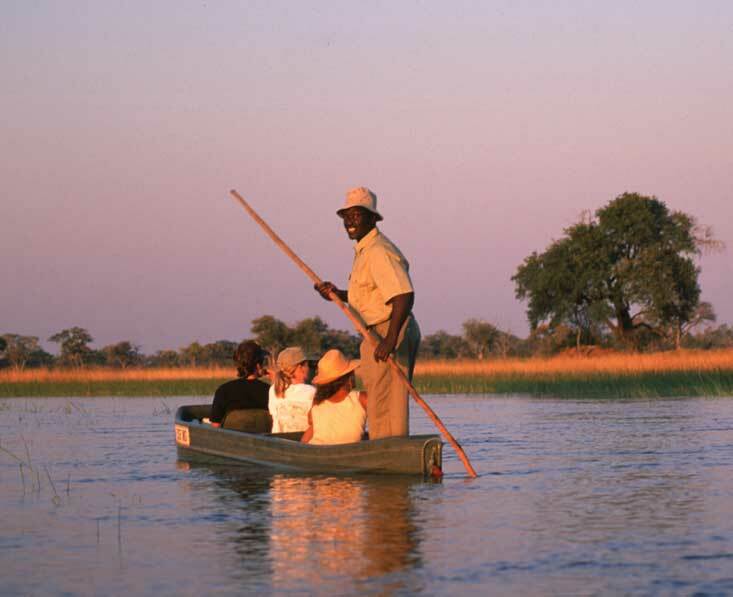 Mokoro and boat trips trips are available in many Delta camps near the water now. Game viewing is excellent. August NNNThis is winter and it can be very cold in mornings and evenings. Thousands of breeding birds such as storks and herons begin to congregate to nest in heronries such as the one at Godikwe near Kwara in the Delta. It’s dry and dusty away from the water sources, and wildlife is finding itself in smaller areas close to water which can sometimes cause tensions and drama. It’s a good time for bush walks now that the high grasses have died down. September NNNIt starts to get hot now and the heat builds up quickly over this month and the next. Temperatures of mid-30s are common and night temperatures are back to around 15°c. The floodwaters start to slowly drop from now on. Carmine bee-eaters and other migratory birds begin to arrive back in good numbers. The Godikwe heronry is jam-packed now. September and October are the peak months for elephants and buffalos by the Delta and rivers such as the Chobe, Linyanti and Kwando. This is a time of plenty for predators as the dry season inevitably takes its toll on some of the plains game. 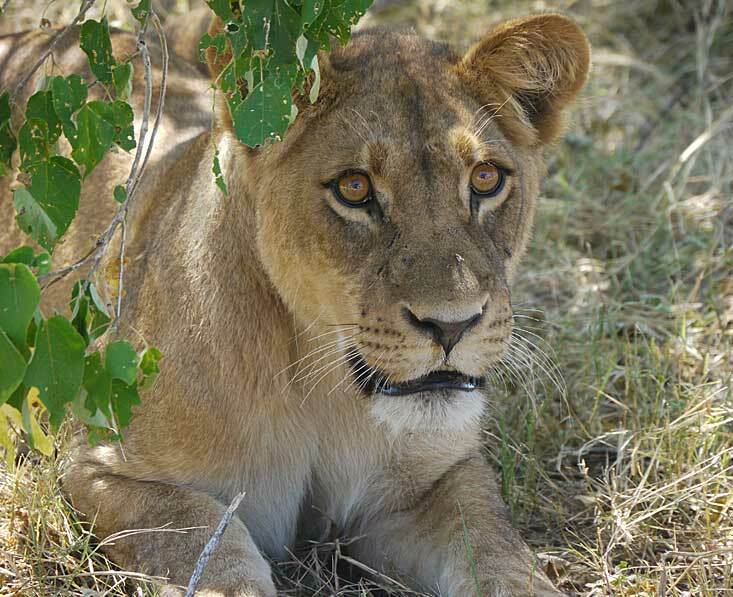 In the Kalahari, solitary black-maned lions begin to call the females to them once more – it’s a great sight (and sounds), but be warned that it is seriously hot. October NNNThis is the hottest month in Botswana with daytime temperatures often well over 40°c. If you can stand the heat, this is one of the very best months for game viewing, but you (and the wildlife) definitely need to avoid the midday heat. September and October are the peak months for elephants and buffalos by the Delta and rivers such as the Chobe, Linyanti and Kwando. This is a time of plenty for predators as the dry season inevitably takes its toll on some of the plains game. The heronries are now absolutely full of birds – an awesome sight. The Kalahari is off-limits for most visitors due to the heat often reaching the high 40s. November NNIt’s stiflingly hot until the rains arrive. The first rains come about mid-late November and everyone and everything breathes a sigh of relief. 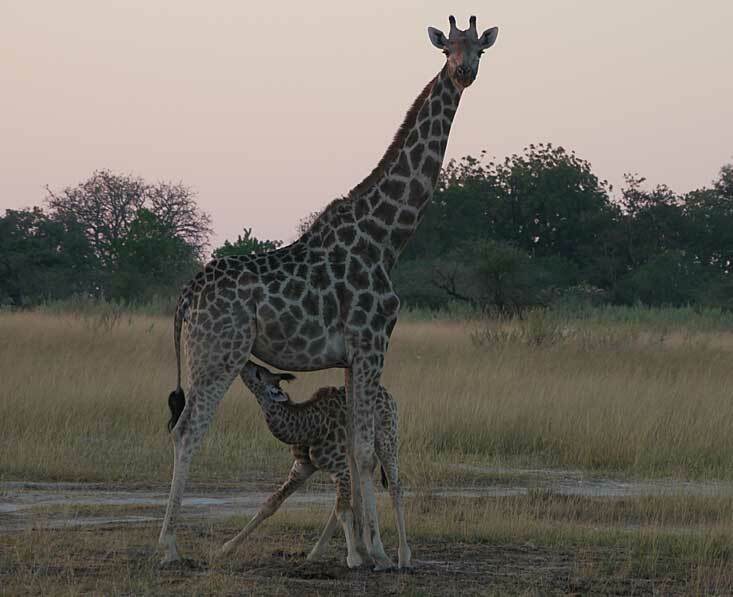 With the rains come the newborns – first the tsessabe, then the impala, red lechwe and more. It is feast time for the predators once more. Herds once again begin to move away from permanent rivers to seasonal grasslands. Life seems to begin again and colour and freshness returns to the landscape. Migrant birds start to arrive later in the month. December NNAntelope youngsters grow quickly, and the wildebeest begin calving. The first rains hit the desert regions and very quickly the temperature drops and the arid plains become bright green grasslands which attract herds of antelopes and more. 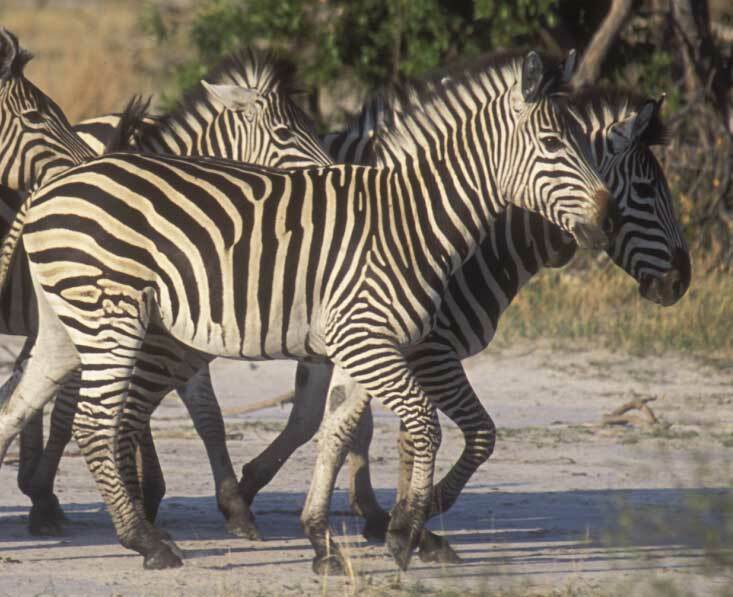 The pans such as Nxai and Makgadikgadi once again fill with zebra and wildebeest and other wildlife, to the joy of attendant predators. Thunderstorms come every few days and this is again a dramatic time for photographers. Most of the migrant birds have returned by now.